Well, so much for the pre-game hype. Peyton Manning and Kurt Warner the focus of this much anticpated matchup between one of the better AFC teams in the Indianapolis Colts and the Super Bowl runner-up Arizona Cardinals. Unfortunately for the Cardinals faithful, Manning – as he tends to do with regularity – exploited the Cardinals’ secondary as Indianapolis manhandled Arizona in Glendale, AZ 31-10. Again, so much for the pre-game hype. How dominant was Manning in his debut in Glendale? Consider the fact that he threw three touchdown passes in the second quarter alone. And as per custom, the Colts’ pass rush was in Warner’s face all game – or so it seemed. 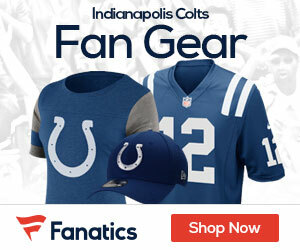 Things were slow initially for the Colts and Manning; the Cardinals drew first blood as kicker Neil Rackers converted a 38-yard field goal, giving Arizona an early 3-0 lead late in the first quarter. But then Manning would warm up to the occasion as he threw a trio of touchdown passes, a 20-yard strike to wide receiver Reggie Wayne, a 10-yard scring pass to tight end Dallas Clark and a 53-yarder to WR Pierre Garcon. By the time the Cardinals got the license number to the Mack truck that was the Colts, Indianapolis was up 21-3 going into halftime. 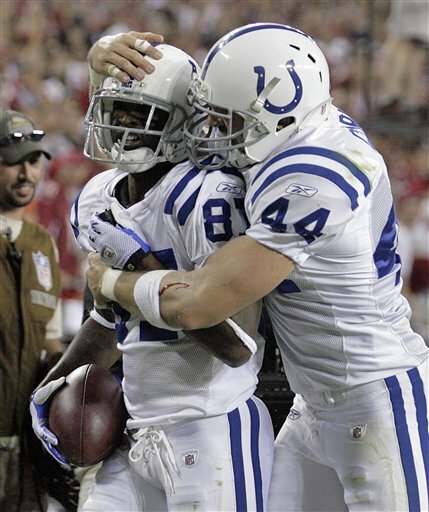 Although Warner would toss a 10-yard TD pass to WR Anquan Boldin with 10:50 left in the third quarter, Manning would match Warner with a TD pass of his own, this time a 3-yard pass to RB Joseph Addai, boosting Indianapolis’ cushion to 28-10, more than enough to help the Colts coast to the easy victory. Manning had a typical night – at least for him – as he went 24-of-35 for 379 yards with 4 TD’s and an interception while Warner did alright himself, going 30-of-52 for 332 yards with a TD and 2 INT’s. Neither team ran very well as Addai led all Colts rushers 63 yards on 13 carries while Indianapolis’ run defense performed a stellar job, holding the Cardinals’ Tim Hightower to 22 rushing yards, although to Hightower’s credit, he also caught 5 passes for 39 yards. Wayne led all Colts receivers with 7 receptions for 139 yards and a score while RB Donald Brown caught one for 72 yards; Garcon caught 3 balls for 64 yards and a TD while Clark caught 7 for 62 yards and a score. Steve Breaston led the Cards’ receivers with 7 catches for 94 yards while Boldin caught six for 83 yards and a TD; Larry Fitzgerald caught seven passes for 76 yards. Indianapolis (3-0) returns home to host the Seattle Seahawks while Arizona (1-2) returns home and will have their bye week; they do not play again until October 11 when they host the Houston Texans. Chalk up another Pro Bowl trip for Manning and another 10-win season. He is doing this without his #1 & #3 WRs from last year as well.